Memorial services for Rollie Kastner will be held on Monday, February 18, 2019 at 11 AM at Helgeson Funeral Home in Roseau. Visitation will be one hour prior at the funeral home. Military honors will be by the Roseau Memorial Honor Guard; with interment at the Middle Forest Cemetery in Fordville, ND at a later date. Memorials are preferred to the Roseau Relay for Life. Rolland John Kastner passed away on February 9, 2019 at the LifeCare Greenbush Manor at the age of 81. Rolland was born in Fairview, IL on April 19, 1937 to Samuel and Bessie Kastner, welcoming him home were his six siblings, Robert, Kenneth, Harvey, Oscar, Betty and Flora. Rolland grew up on the family farm near Manito, IL. 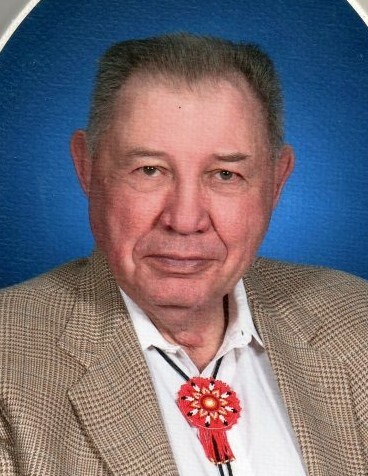 After graduating from Forman High School in the spring of 1955, Rollie enlisted in the U.S. Air Force on June 28, 1955 where he served his country until his retirement in 1976. In 1960, while stationed in Ohio he met his first wife, Carol Law. To this union were 3 children, Sheryl, James and John. In 1974, Rolland met Diane Dahlen Schmechel and they were married on November 17th of that year. Diane had two children of her own. After living in East Grand Forks, MN and Bagley, MN for a time, they moved to Roseau, MN in 2001 to be closer to family. Rollie enjoyed riding 4-wheeler in the woods with is dog, Buddy; watching their grandkids activities and spending quality time with his family. Blessed be his memory. He is preceded in death by his parents; siblings; son, John and stepson, Bruce. He is survived by his wife Diane of Roseau; daughter Sheryl ( Michael) Oligny,; son James (Tammy) Kastner; step daughter Lorraine (Sheldon) Rice; Bruce’s wife Lesa Schmechel; grandchildren Nicholas (Heidi) Oligny, Therese(Adam) Wilson, Lauren (John)Donahue, Phillip and Collin Oligny, Loren (Sean) Hudson, Christopher, Adrianna, and John Kastner, Sarah(Mike) Picard, Teresa ( Bryan) Hulst, Erin(Dan) Enos, Emilee (Erik Sundberg) and Amanda Schmechel; & 20 great grandchildren.